I had a good modeling class today, and I want to share what went well. 1. I had the students work in pairs to whiteboard solutions to the problems on worksheet 2 in the Unbalanced Force Particle Model [UFPM] unit. Unlike most of the worksheets, this one advanced some ideas through appropriate questions, so I didn’t need to edit it significantly. 2. I paired students with an eye toward challenging everyone. Two students needing reinforcement of basic ideas got the first problem, while the complex final problem went to a pair who were ready for it. At the same time, each pairing combined students who didn’t normally work together, which led to a lot ogood dialogues. 3. The solutions were all essentially right, and the students did a good job of explaining them. I even saw two students using my normal force demonstrator (below) and videorecording a pair of falling objects. 4. Even better, they did a good job of bringing forward some misconceptions. For example, many claimed that a passenger in a freely-falling elevator would hit the ceiling, and supported this belief through a chain of argument that rested on the axiom that more massive things accelerate faster when they fall. During this discussion, I had to say very little, as the students carried through the argument. 5. 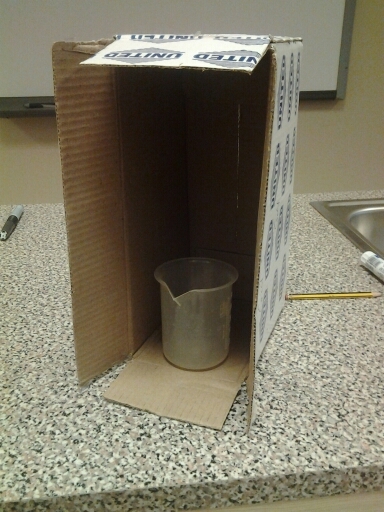 Twice I interrupted with impromptu demonstrations, the first (below) showing a beaker in a falling box, and the second dropping two objects of vastly different mass. 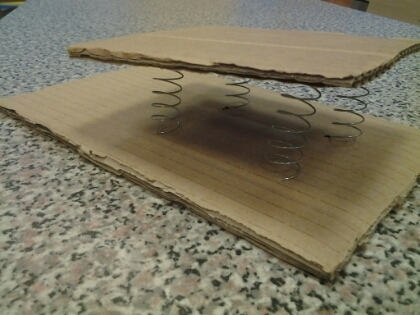 I used a paper clip and a 1 kg mass — I think I will show a vacuum freefall clip later this week, to reinforce the result. Both times, the demonstration steered the discussion in the relevant direction. 6. We managed to spend a few minutes getting ready for the next lab, in which we will look at how surface area and mass affect the frictional force. We are taping force gauges onto the tops of ramblers — it is already looking promising. This entry was posted in Uncategorized and tagged misconcepions, modphys, spring model on November 10, 2014 by Danny.